Peter Johnson, an Idaho businessman who stood at the center of one of the Northwest's biggest political and financial maelstroms in recent history and didn't blink, died Sunday in Boise. He was 82. 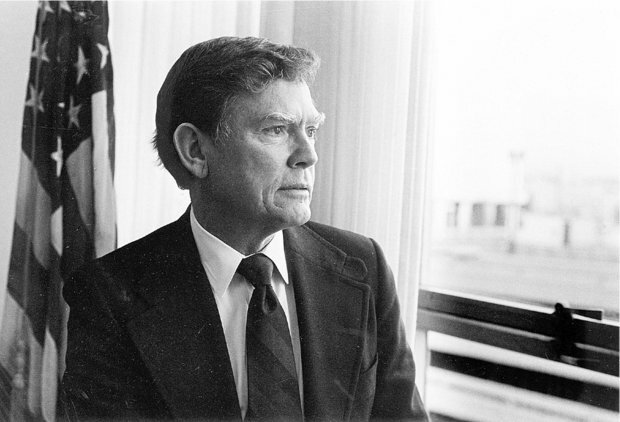 Johnson, a long-time and successful wood products executive, was tapped by President Ronald Reagan shortly after his election to take over as administrator of the Bonneville Power Administration, the federal power marketing agency that sells power from 31 hydroelectric dams in the Columbia River Basin. It was a plum appointment in the region for a big supporter of Reagan, arranged by U.S. Senators Jim McClure, R-Id, and Mark Hatfield, R-Ore. But Johnson was walking into a colossal mess. Bonneville was the financial backstop for the Washington Public Power Supply System's foray to build five nuclear plants to meet the region's forecast power needs, and the effort was rapidly unraveling. At the same time, Johnson was handed the responsibility for implementing the Northwest Power Act of 1980, a piece of energy legislation so complex that no one fully understood what it did or how it would work. The act grew out of efforts to allocate the benefits of the federal power system - between states, between customers of public and private utilities, and between a diverse groups of stakeholders. It created the four-state compact known as the Northwest Power Planning Council to forecast demand and plan how to meet it, and put Bonneville on the hook to fund everything from conservation to wildlife restoration. The nuclear effort was plagued by delays, incompetence, massive cost overruns and ultimately by the fact that the underlying power wasn't needed. Yet there was still enormous pressure to complete several of the plants, not only for the energy, but for the jobs and economic development they represented in rural communities. BPA's ratepayers were guaranteeing the construction of three of the five plants, and Johnson arrived as the agency was approaching the financial precipice, with mounting costs driving rate increases and the prospect of more to come. While he had little prior experience in the energy business, and limited political support from a congressional delegation that didn't want to be tarred by the controversy, he was a decisive and successful businessman who wasn't hamstrung by a conventional utility mentality. "They brought in the business guy, and he had to go in and start making difficult decisions, huge decisions involving billions of dollars in debt," said Sandra McDonough, a former reporter who covered the unfolding fiasco and now runs the Portland Business Alliance. "These were enormously difficult negotiations, and he kept his cool, drove all the warring parties to the table got them to make these decisions on these plants that were putting the whole energy structure of the region underwater." Indeed, Johnson is widely credited with having the business acumen to recognize the problem, and the backbone to first halt construction on two plants and ultimately terminate them, despite enormous pressure to move forward. Those decisions ultimately stabilized rates and allowed BPA to continue making its payments to the U.S. Treasury. Two additional plants not funded by BPA were also halted, prompting the largest municipal bond default in history at the time. "It was a very tough decision for Peter, as there was still a lot of emotional and political investment in those WPPSS plants," said Angus Duncan, president of the Bonneville Environmental Foundation. "He took a huge amount of heat and he gets a lot of credit for staring at a difficult decision and making that decision based on the evidence." Elliot Mainzer, BPA's current administrator, issued a statement that described Johnson as a man of great character and incredible business acumen. "He was an iconic figure whose influence is still present at BPA today." In 1986, Johnson returned to Idaho, where he started the Payette Lake Water Quality Council and co-founded the Idaho Community Foundation. In 1992, the 60,000-acre Peter T. Johnson Wildlife Management Unit was dedicated in his honor. He was an accomplished pianist, a sculptor and a pilot. He is survived by his wife, Carolyn, four daughters and 10 grandchildren.